The Church Office will be closed for the Christmas holiday season on Monday, December 23, 2013 through Friday, January 3, 2014. 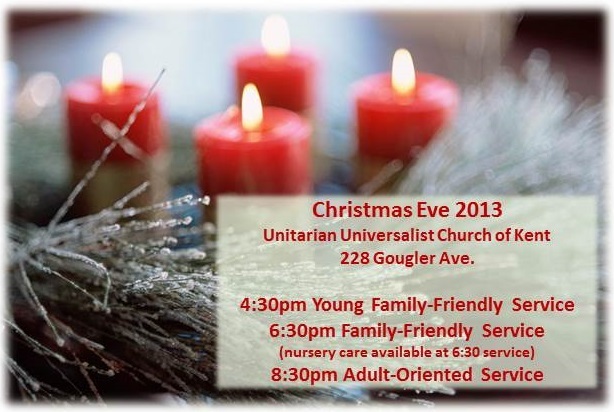 During the week of December 23 – December 31, please contact Rev. Christie Anderson if you have an urgent need. Rev. Melissa will be returning from maternity leave Wednesday, January 1 and will be available by cell phone if you have an emergency; she will be back working her regular schedule January 2.
our lives and this dark season of the year. We are in need someone to organize a reception between the two services on Christmas Eve. If you are interested, please contact Carol Gould. Thank you! Our Traditional Community Tree is now in Fessenden Hall! Each year, members and friends of this church fill this tree with ornaments from their own homes. Please consider sharing one of your favorites with us! If you do, please mark it carefully with your FULL NAME so that we can be sure to return it to you after the season. In preparation of our next Stewardship Campaign, the Finance Committee is requesting that Budget Requests for Fiscal Year 2015( beginning July 1, 2014) be submitted at this time. Please submit your requests to MaryBeth at [email protected] or Finance Chair, Gene Wenninger no later than January 6, 2014. Has your contact information changed in the last year? Have you notified the church office of the new information? The Membership Team is updating the directory for release within the next month or so. There is still time to add or change your information. We can also include a photo. You can email us one, or we can take a photo of you. Your information can be emailed or called to Andrea Case . Radiolab and Pancakes is taking December off, but will return in January. I hope that all of you have wonderful holidays and beautiful New Years. ~ Cheryl Spoehr. Anyone interested in attending a Christmas Potluck dinner please sign up in Fessenden Hall. Please indicate what you would like to bring; we suggest that you provide for at least 6 people. We will gather in Fessenden Hall on Christmas Day at 2:00 pm to share a meal. If you have any questions, please contact John Kluth or Mary Maske. Holiday Family Movie Night This FRIDAY! It is time to mark your calendars for our annual X-Mas movie night! Come to Fessenden Hall on Dec. 13 at 7:30 pm for the funniest Christmas movies and cartoons ever made. We will start with the classic film Santa Claus Fights the Devil. This is a pot luck affair, so bring your favorite holiday dishes. If you have any questions, contact Cheryl Spoehr. The Patricia Pownall UU Book Group will be meeting on Tuesday, January 14 at 7 pm at the home of Betty Kendrick. Please bring a snack to share. This month you may choose between two books on a similar topic. One choice is The Last Runaway by Tracy Chevalier. Forced to leave England and struggling with illness in the wake of a family tragedy, Quaker Honor Bright is forced to rely on strangers in the harsh landscape of 1850 Ohio and is compelled to join the Underground Railroad network to help runaway slaves escape to freedom. The second choice is The Known World by Edward P. Jones. This book tells the story of Henry Townsend, a black farmer and former slave who falls under the tutelage of William Robbins, the most powerful man in Manchester County, Virginia. Making certain he never circumvents the law, Townsend runs his affairs with unusual discipline. But when death takes him unexpectedly, his widow, Caldonia, can’t uphold the estate’s order. In February we will be reading Empire of the Southern Moon by S.C. Gwynne and in March we will be reading The Signature of All Things by Elizabeth Gilbert. If you have any questions you may contact Bonnie Harper. All are welcome. The Library Committee will be selling the 2013 edition of “Here We Have Gathered” during coffee hour this Sunday. It is a collection of reflections by church members on many of the various activities the congregation supports. Each edition is $5.00 and is the Library’s principal fundraising effort for the year. They would be wonderful adult and young adult holiday gifts, and you would be supporting the Library at the same time. Our profit will be used to purchase new books. This book was recently donated to our collection by Margot Milcetich of our church. Margot is the founder of the yoga teacher training school, Brahmirishi Yoga, and she teaches at Kent Yoga. She shares her story in which she alleviates her confusion and suffering with the help of meditation, marriage and a guru. This is a local story dealing with her life in the Kent area, and the values that meditation and yoga gave to her. At the end of the book is a glossary of terms relating to the practices used in the texts to which she refers. We have placed this book in a new Library category, Writings by Church Members. The proceeds of the sales of the book will benefit Swami Bawra’s free school in Jabalpur, India. Submitted by Martha Kluth. Unitarian Universalist Justice Ohio (UUJO) seeks a part-time Administrative Coordinator from the Cleveland area to begin no later than February 15, 2014. The Independent Contractor will work forty to sixty hours per month out of home at a starting rate of at least $15 per hour with reimbursement for travel and other expenses. Administrative management of data base/membership roster/budget reports (Excel); Webmaster (wordpress), Facebook social media/Google Group Manager; Exchange Newsletter Editor/action alerts (Mailchimp), UUJO email. Administrative support for the Officers, Steering Committee, and issue task forces facilitating conference calls, webinars, meetings and reports. Qualifications: B.A. degree (or its equivalent) preferred. Self-starter; good interpersonal skills; able to work collaboratively; advanced computer, software and Internet skills; must be willing to attend some evening conference calls; need valid driver’s license and ability to travel to some meetings; administrative experience, commitment to justice and UU principles a plus. Compensation: $15 /hr. 10-15 hours/wk. Flexible, variable by wk up to 60 hours/month. We are currently seeking donations for Holiday Gift Fair! We are accepting donations for Gifts made from the Heart – handmade items; Gifts made from the Hearth – homemade goodies; And finally Re-gifted items that are new or like new. The kickoff of the Holiday Gift Fair is scheduled for Sunday December 8, 2013 during coffee hour and will run for 3 Sundays in December: December 8, 15 and 22. Please bring your donations to Fessenden Hall. If you have questions, please contact Meg Milk. Thank you for your support of this UUCK tradition.